It was only yesterday I spent a good 15 minutes standing shoulder to shoulder with my fellow man, staring at a mountain of flowers in the supermarket. Every guy here looks as blank faced and as clueless as me, and most of these flowers are dead or battered from blokes 'man handling' the stock and throwing it back! I find some nice ones and get back home to continue my first of 2 secretive projects. If you haven't seen it yet, I uploaded a Valentine's Day video a while back. 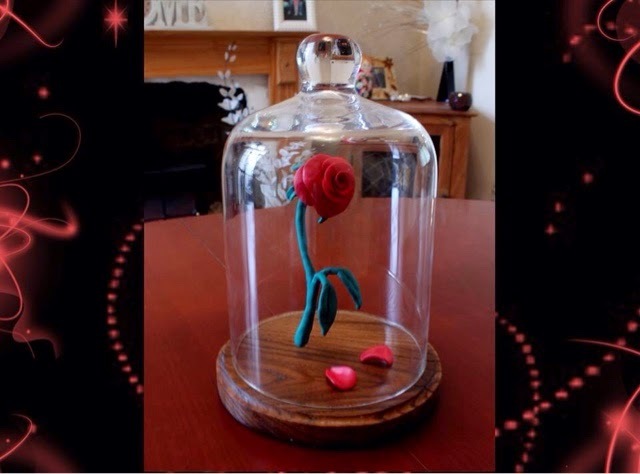 It may be a little late now if you wanted to copy it for Valentine's Day, but it's the rose from Disney's "Beauty and the Beast"! Every girl would love that for any occasion! If you are unsure on how I made the rose, I will be making a step by step guide on here soon. About a year ago I uploaded a video titled "how to dry green wood". It wasn't so much a "how to" but more a query and an experiment on how to dry branches in the microwave. This video is, by far, the most viewed video I have on my channel, so I've finally got around to answering some questions and giving my view/opinion on how to dry green wood within the home without a kiln. I may not be uploading many pictures in the near future as clients have asked me to keep the next projects secret until they are revealed to their partners, but I should still be updating things on here and will make the odd small project video on YouTube. Please leave comments and suggestions for things you would like to see on here or on YouTube.